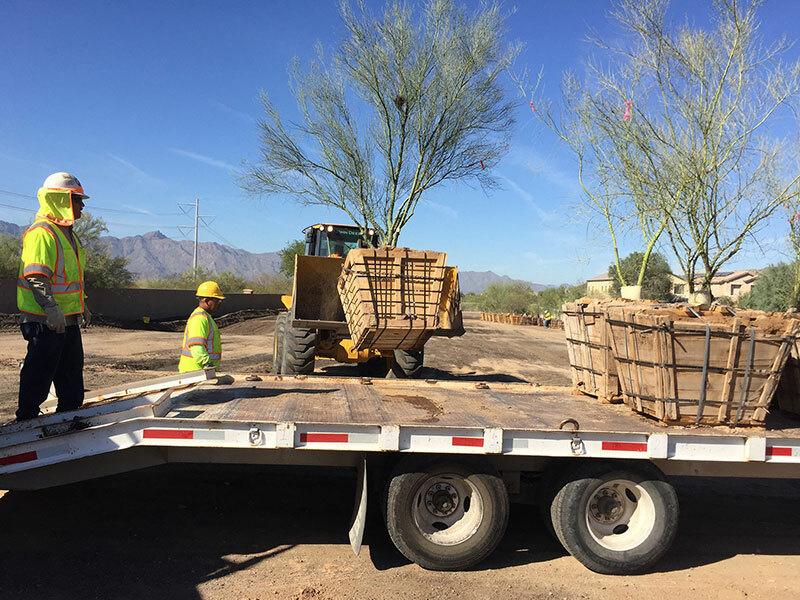 Native palo verde trees being salvaged for use in native plant landscaping. Photo courtesy Arizona Department of Transportation. Native plant preservation provides a number of benefits. Native plants are low maintenance and require far less water than non-native plants because they are adapted to local environmental conditions. Additionally, native plants offer beautiful flowers, fruits, and seeds; provide vital habitat for birds, pollinators like bees, hummingbirds, butterflies, and bats; and provide shelter and food for many forms of wildlife. Arizona’s native plant law protects rare plant species and protects others from being over harvested. These plants may not be removed from any lands without permission and a permit from the Arizona Department of Agriculture. In the Verde Valley, some of these protected plants include soaptree yucca, desert willow, and ocotillo. While protecting identified native plants is required by state statute, there are a host of benefits from protecting native vegetation, including species that are not specifically protected by law. Maintaining native plants when land is developed is desirable because they require no supplemental irrigation once established, reduce the likelihood of invasive species following plant removal, and retain a sense of place. Some communities, like Tucson, use mitigation credits to encourage preservation-in-place. For example, preservation of a larger, protected native plant offsets the requirement to replant multiple plants of the same species. Preserving rather than replacing native plants is desirable, as the supply of native plants may not meet the demand in some areas. Including plant nurseries in discussions about community plant regulations and preferences may be necessary to encourage adequate stocks of native plants. When developing a site, it is preferable to maintain a sufficient amount of undisturbed area of native plants rather than to preserve individual native plants sprinkled throughout the property. Doing so provides on-site wildlife habitat and maintains wildlife corridors when sited appropriately. However, native plant preservation can be difficult in higher density development unless the development includes adequate open space. A number of Arizona communities encourage protection and use of native plants, and others have specific native plant ordinances. Communities can identify those native plants that are integral to the character of their community and enact native plant ordinances that can be incorporated into land use codes and standards. Scottsdale’s Native Plant Ordinance is often cited as being groundbreaking and a model for other communities. The City first adopted an ordinance in 1981 because it determined that the presence of indigenous plants contributed to the aesthetic and economic well-being of the community. The ordinance has been revised over the years to include more plants and to increase specificity and enforcement as the City grows. Native plant protection is also connected to the City’s General Plan in the Preservation and Environmental Planning element goal to protect and conserve native plants as a significant natural and visual resource. In its ordinance (City Code Chapter 46 Section 7.5), Scottsdale recognizes that native vegetation is a unique natural resource that enhances the City’s physical and aesthetic character, is important to tourism, stabilizes soil and helps prevent erosion, provides wildlife habitat, and increases property value. In addition, native vegetation is drought tolerant, requires less maintenance, and uses less water than other landscaping materials. Any land development project that affects plants from the City’s protected plant list is required to submit a native plant program detailing the location and proposed treatment of each plant that will be impacted. A native plant permit is required to remove, relocate, or destroy any plant protected by the ordinance and is issued after approval of the native plant program. Single family projects must submit a program at the time of building plan reviews, while commercial projects must submit a program no later than the time of application to the Development Review Board. While the regulations strive to keep plants in place, plants that must be moved are required to be salvaged unless it can be demonstrated that successful relocation is impossible. Salvaged plants must be replanted within the project. The list is comprised of 15 trees including cottonwood, oak, mesquite, desert willow, and juniper, and 5 “cacti” including ocotillo and soaptree yucca. Failure to comply with the approved native plant program can result in monetary fines of up to $10,000 per plant. These fines are earmarked for plant replacement. The City has developed a number of helpful resources to assist in compliance with the ordinance. These include a guide for homeowners, the protected plant list, an indigenous plant list, permit information including application forms and guidelines, a tracking form for salvaged plants, information on the inspection process, and a list of salvage contractors. Links to other information about City of Scottsdale’s native plant protections can be found here. Pima County Zoning Code includes a section on native plant preservation in Chapter 18.72 Native Plant Preservation. Arizona Protected Plants is also a good resource. Tucson Development Regulations includes a section on native plant preservation.